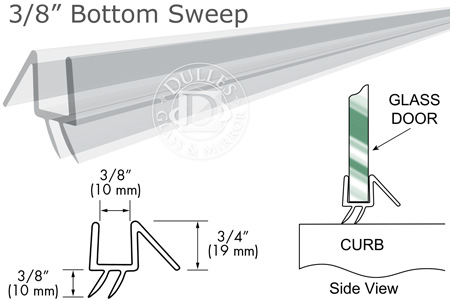 95" Clear Bottom Sweep with Drip Rail for 3/8" Glass is a bottom wipe for 3/8" Thick Glass Shower Doors. Recommended for use with both Single, Inline 180 degree, and 90 Degree Shower Door installations. Used horizontally as a bottom sweep (soft wipe acts as a water resistant seal). Easily snap on bottom of glass door. Achieves a functional and sleek look for shower doors. Comes in ample length of 95 Inches.